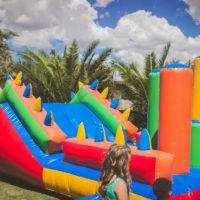 A church carnival in Orlando resulted in five injuries when a bounce house lost a battle with a wind gust, lifting the house full of youngsters off the ground. The children and one woman who tried to hold the bounce house down all suffered injuries, sending at least three people to area hospitals. Days later, a surprise South Carolina wind gust whipped the anchors to the bounce house right out of the ground, whirled it 15 feet above the earth, then slammed it back to the ground unceremoniously. Seconds later, the bounce house right next to it was whisked 30 feet into the air, slowing down only temporarily as it was caught up in nearby power lines. When the lines snapped, the bounce house dropped with a thud to the ground. In the aftermath, five children were injured in this April 2017 bounce house disaster. And while these were some of the most recent bounce house incidents resulting in hospitalization, they are certainly not unique situations. If you or a loved one experience serious injuries due to a bounce house disaster, you may wish to consult a personal injury attorney. Nationwide Children’s Hospital conducted a study to find out just how prevalent bounce-house injuries are in this country. And what they discovered is pretty harrowing. The majority of children injured in bounce houses were 6-12 years old, and over one-third were 5 years old or younger. About 20 percent of children experienced minor head and neck injuries, although roughly three percent of them required hospitalization. Younger children were most likely experience fractures, while older children suffered more sprains and strains. Legs and arms are the most frequently injured body parts. Ensure that bouncers are close to equivalent in weight. Additionally, experts advise that bounce houses should never be set up when wind speed exceeds 15 mph. The lengths of the stakes holding the house to the ground are a consideration, as well. Those shorter than 3 ½ feet may not secure a bounce house when micro burst winds come up. They should be anchored at least every five feet around the structure. Despite safety recommendations, bounce house injuries occur with alarming frequency in the United States. If you or a loved one is the unfortunate victim of a bounce house injury, especially if negligence is involved, the experienced personal injury team at the Law Offices of Robert W. Elton can help. Contact our knowledgeable attorneys in Clermont today for a free consultation.